Motana Fly Company has introduced an expanded line of jig hooks, jig beads and jig head flies. Just in time for fall and winter fly tying season, MFC introduces an expanded line of jig hooks, jig beads and jig head flies by top designers. 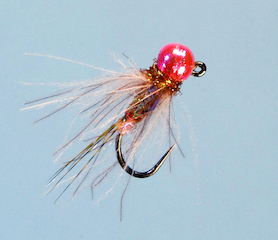 MFC is also launching more than a dozen new tungsten jig-head fly patterns, like Keller’s Peach Fuzz below, in pink.